I spent the last couple of weeks in the company of Julie’s two kitties in Toronto, while she and her family were away. As a result I got a bit more time zipping around on transit, and did a few more things in Toronto than I normally would get the chance to do. Transit time is knitting time, of course, and so I made sure to get a few rows in on my current socks. One day on the subway I was knitting along and a friendly woman nearby said, “oh good, I thought I was the only one.” I said “oh no, knitters are everywhere.” She pulled out a bit of yarn from her bag and showed me, reporting that she had just had a trip to Romni, and I nodded in understanding. (Romni trips are serious business, man). She saw I was knitting socks and we compared notes on our needle preferences (she likes using the tiny circular needles, I was using DPNs at the time), and I asked her opinion on the yarn color I was using since I was worried it was looking a bit more bubblegum pink than it had while in the skein (she reassured me it did not). And then, it was time for me to get off at my stop and we parted ways. A few minutes later, the only thing I thought was weird about the encounter was that I forgot to exchange Ravelry names. I think the colors are gorgeous! It is always fun to meet knitters while traveling! I take the train to work, an hour each way, so I can get a lot of knitting in. I see a lot of crocheters but not very many knitters. And when people see me knitting socks, you wouldn’t believe how many say, you know, you can buy those at the store, right? I just smile at them. They don’t understand how wonderful homemade socks are or that it’s my therapy. I love meeting other knitters out and about in the world. WE are everywhere! Knitters are taking over the world. Samantha, we are a close KNIT group you might say. A few summers ago when I was driving from Michigan (USA) to New Mexico (still USA) I would stop at a rest stop and sit and knit. Lots of women stopped to ask me what I was knitting. I guess seeing an old man knitting was kind of odd thing to encounter at a rest stop. Thanks for the post it is nice to hear about other knitters. Thanks for letting me know about Ravelry. I just joined. I always love seeing the socks you are knitting ;D Are the socks on the train the same ones that are on the coffee table with Downton Abbey on the TV? What is the color of the Sweet Georgia Cashluxe Fine Yarn you are using? It’s gorgeous. Now, I want pink socks! I had a similarly lovely conversation with another knitter on the bus a few months ago. She told me that, a couple of times when she’s been sitting in the back on a relatively empty bus, she’s even tried on her sock-in-progress! 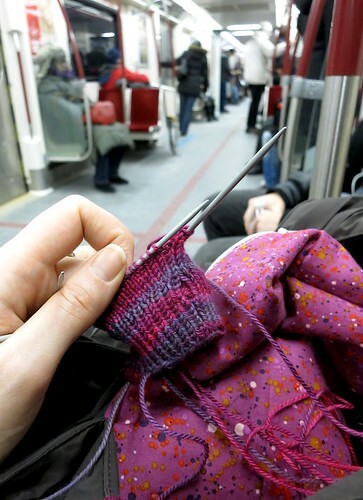 I have yet to have such an experience, though I faithfully knit on public transit! Maybe there aren’t as many Boston knitters.. Tiny circular needles? Now I’m curious! In this side of the world, I hardly see anyone crochet or knitting in train. 80% of people played with their phone or ipad. I feel I am the only nonna in the train busy with needles and hooks. I am knitting in all my occasions. sometimes,crocheting, I think this is easier to do in any condition, without to risk to kick off the neibours. Please detail aboult little niddles. Can you offer a link?